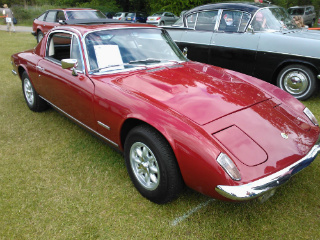 The early Lotus Elan sports car. In 1959, Lotus developed the Lotus Ford Twin Cam engine, which was an amalgamation of the then current Ford Anglia and Ford Classic saloon, 4-cylinder engines. Subsequently, the engine made its debut powering the Lotus 23, a small mid-engined sports car, at Nurburgring in May 1962. 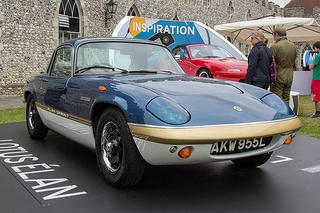 In the beginning, Colin Chapman visualised the Elan as being a replacement for the Lotus Seven and, like the Elite, built as a glassfibre monocoque construction. 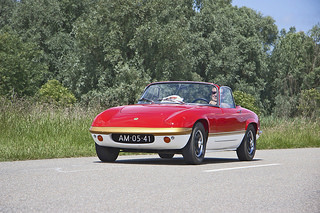 However, by the time it reached the prototype stage, it was agreed that it would incorporate a steel backbone chassis construction, which meant that the Elan would be not only light and rigid, but also much easier to manufacture than its predecessor, and with excellent handling characteristics. 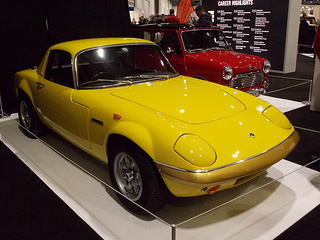 The Elan was the first Lotus sports car to combine a steel chassis with a fibreglass body. Interestingly, early versions were offered as a self assembly kit. In October 1962, the Lotus Elan sports car, also known as the Type 26, was launched at the Earls Court Motor Show in London as the Elan 1500. It was a two seater convertible, and the successor to the Lotus Elite. The first twenty cars, fitted with a 1498 cc engine, were recalled, and their engines were replaced by the newly arrived, five bearing, 1558 cc units which were immediately converted into the Lotus Twin Cam variant. All subsequent cars were fitted with this engine, which developed 105 bhp. 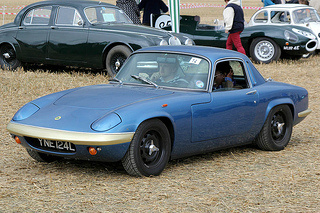 The Elan had four wheel disc brakes, rack and pinion steering, and independent suspension all round. In 1963, a hardtop was offered as an optional extra. 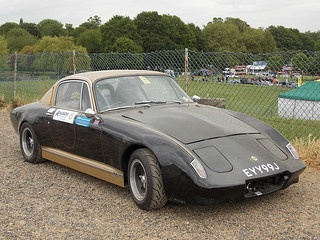 Most of these faults were overcome by November 1964 when the Elan Series 2 and Elan Special Equipment (SE) models were launched, the latter being fitted with the latest 118 bhp Twin Cam engine. The Series 2 were fitted with larger disc brakes and an uprated interior. They sold well in the UK, and the US export models used Stromberg carburettors to satisfy emission control regulations. 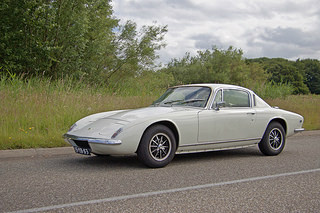 In September 1965, the Elan Series 3 sports car, a fixed head coupe, also known as the Type 36, made it appearance, and its distinguishing feature was the extended boot lid at the back. In August 1967, the Type 50 Elan +2, simply known as the Plus Two, was launched. It was two feet longer, ten inches wider, and weighed 340 pounds more than the standard Elan, but with the performance of the fixed head coupe. Fitted with the 118 bhp Twin Cam engine as used in the Elan SE, it included such luxuries as wind-up windows, carpets, a heater, and a wooden facia. Most models were fitted with twin Webber carburettors, although some Sprints and later Series 4's used Dell'Ortos, while Strombergs were fitted to early Series 4's. The Elan's four speed gearbox came from the Ford 2000E saloon, whilst that in the Plus Two S came from the Maxi saloon. Differentials came from the Ford Cortina saloon, and the steering rack from the Triumph Herald saloon. The Sprint and SE models featured knock on wheels. 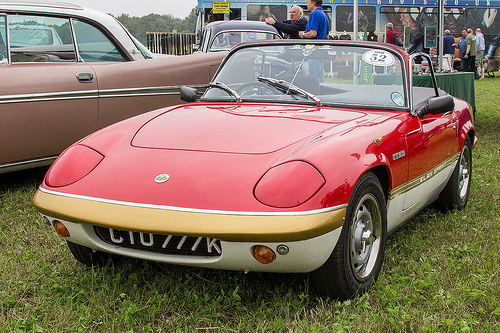 In late 1967, the Elan SE was fitted with a higher final drive, servo assisted disc brakes, knock on wheels, and a leather rimmed steering wheel. In 1968, the Series 4 made its appearance whilst, in April 1969, the Plus Two S was introduced. However, in January 1971, what would become probably the finest model in the range was launched, and was designated the Lotus Elan Sprint. It was powered by the 126 bhp, large valve version of the Twin Cam engine, with a top speed of 121 mph, and a 0-60 time of 6.7 secs. It was fitted with more flexible transmission couplings to eliminate the surge inherent in earlier models. 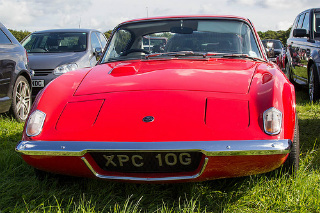 Production of the Elan ended in 1973, when it was succeeded by the Lotus Elite Mark2. On the other hand, the Elan Plus Two was phased out in 1975, being replaced by the Lotus Eclat. 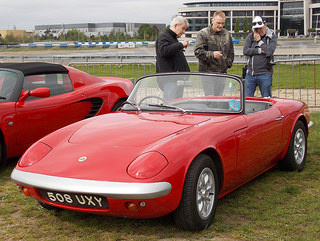 A total of 12,224 Lotus Elans were built, plus a further 5,200 of the Plus Two model. 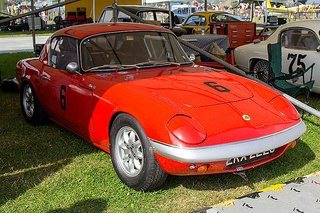 Unlike its predecessor, the Lotus Elite which was, in essence, a financial disaster, the Elan was designed and built with close attention to controlling costs throughout the manufacturing process. 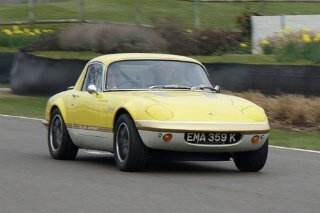 In fact, in the end, the Elan was Lotus' first financial success, and helped fund the companies' drive into motor racing. 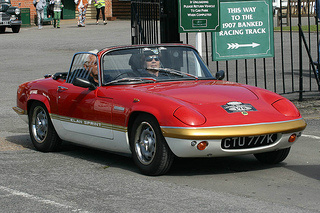 Furthermore, it has been suggested that the Elan was the template for the creation of the 1989 Mazda MX-5 sports car. 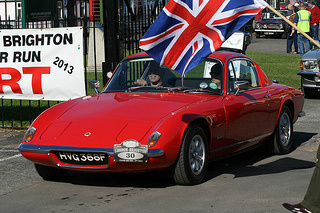 A 1964 Lotus Elan Series 1, one of the early models, in very good condition, would fetch in the region of £22,000/$35,000.